The Random Rants, Raves, and Observations of a total Gearhead. And here I thought that Pontiacs were "Built for Drivers". Not good ones, apparently, as the owner of this parked G6 clearly proves. 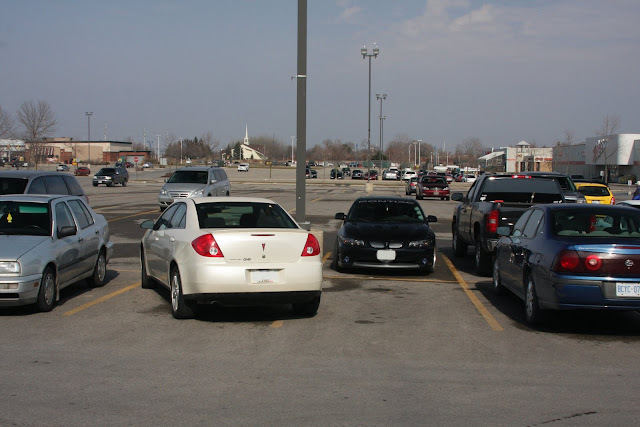 Actually, you have to give this knob some credit, as they have managed to effectively screw up four parking spots at once. That level of inconsideration/incompetence borders on skill. For this excellence in failure, you, Sir or Madam, are most deserving of a Jackass Award. You can find my Wheels review of Porsche's 2011 Cayenne S Hybrid here. I work in a town that has a General Motors assembly plant, therefore there is a disproportionate amount of GM and domestic product both in my door at work and around where I live. Don't think that I'm singling GM or the Detroit Three out for my rants - I just see more of their vehicles to rant about. A WORD OF WARNING AND AN APOLOGY: my blog updates are infrequent and randomly timed, and I seldom ever remember to check Comments when I am here, so please do not be offended if I don't respond or reply to you.